Peel & Stick and Vinyl Wallpaper has become increasingly popular over the years. It is an excellent, more temporary décor option for those of us that like to switch things up all the time. Maybe all the buzz is due to the increase in people choosing to rent? Or Maybe we all just have commitment issues. Either way, Peel & Stick Wallpaper is a great option to quickly and easily update your space and in a bold way! Interior Designers and DIYers alike have caught on to the fact that this product is more versatile than what meets the eye. Because of its adhesion properties, not only is this wallpaper option a more short-term one, but it can also be used on a multitude of surfaces! It is still durable and easy to clean. This makes it a great option for high traffic areas such as table tops or appliances. Here at Totally Custom Wallpaper, we are inspired by others thinking outside the box with their wallpaper additions. Check out some of these great ideas! 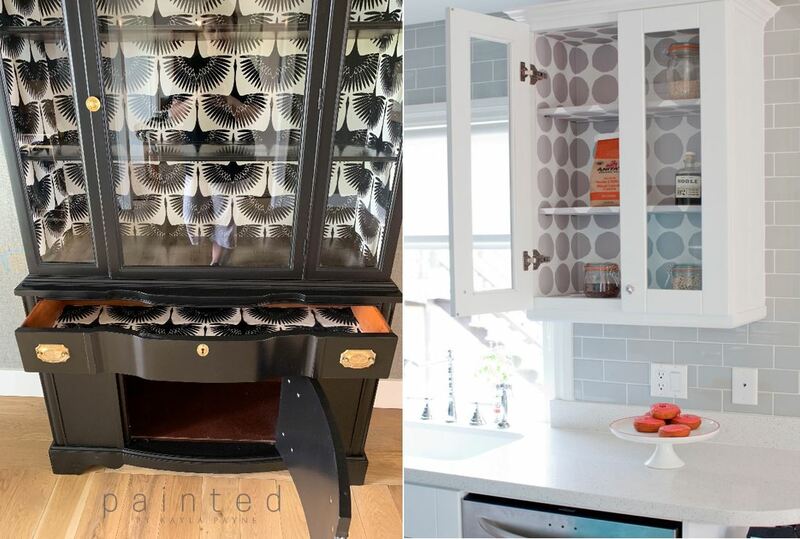 We love what this blogger did with her standard refrigerator! This is such a fun and easy way to give your kitchen a designer look! And trust me, it is MUCH cheaper than having to purchase new appliances. 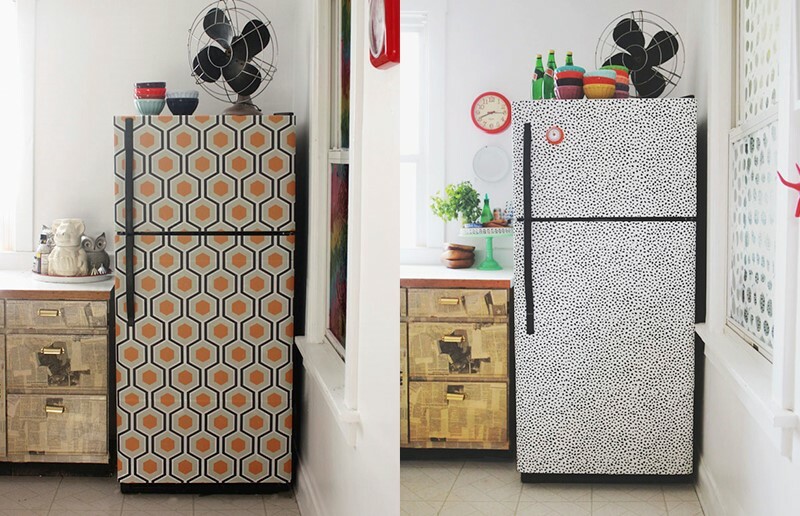 This is a great idea for renters having to face looking at an ugly kitchen every day! We can’t get over how this wallpaper lover chose a chic black and white pattern for her home display case! Place a few glitzy or silver items along the shelves and you’ve got yourself a great conversation piece for years to come. Someone else used peel and stick but to line the inside of their cabinets! This takes exposed shelving to the next level! 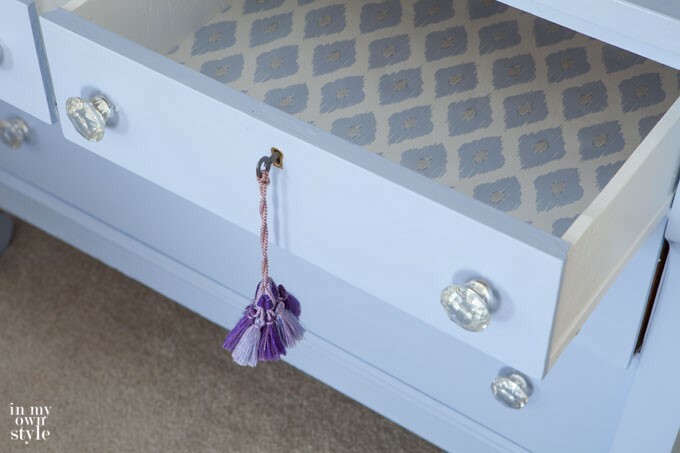 For a little more private DIY upgrade, use this same concept with lining the inside of your pull-out drawers. Picking out your pants will never be the same. Headboards can be ridiculously pricey. And in my experience, I’ve never been able to find one that I truly love. Purchasing something traditional would be settling for less than I desire. A great solution to this issue is a Custom Wallpaper Headboard to perfectly suit your style. Not only are you able to change it up easily over time, but the design, print, or pattern is 100% whatever you’d like it to be. Find a design that matches with your existing decor, or have our experts here at TCW create something from your imagination. A pop of color or a perfect blend-in. The sky is the limit. What ideas can you come up with to use Peel & Stick in your home? The options are endless! Give us a call to see how we can help inspire you to use wallpaper in alternative places and spaces. Wanna Share This? Choose Your Platform!